The HMC463LP5 HMC463LP5E is a GaAs MMIC PHEMT Low Noise AGC Distributed Amplifier packaged in a leadless 5x5 mm surface mount package which operates between 2 and 20 GHz. The Amplifier provides 13 dB of gain, 3 dB noise figure and 18 dBm of output power at 1 dB gain compression while requiring only 60 mA from a +5V supply. 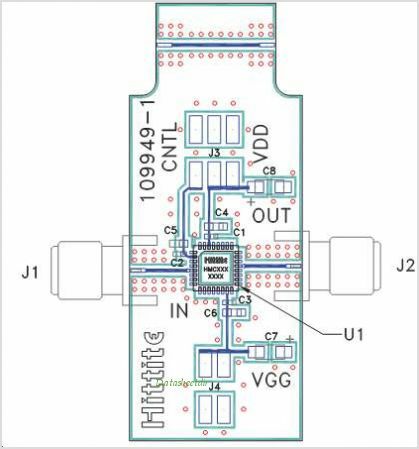 An optional Gate bias (Vgg2) is provided to allow Adjustable Gain Control (AGC) of 8 dB typical. Gain flatness is excellent at 0.5 dB from 6 - 18 GHz making the HMC463LP5 E) ideal for EW, ECM RADAR and test equipment applications. The HMC463LP5 HMC463LP5E LNA I/Os are internally matched to 50 Ohms and are internally DC blocked. This is one package pinout of HMC463LP5,If you need more pinouts please download HMC463LP5's pdf datasheet. 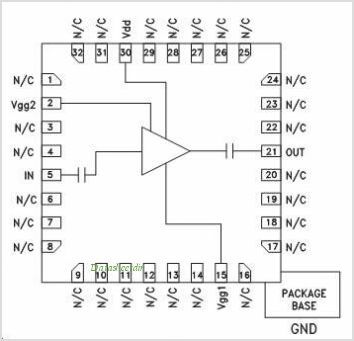 This is one application circuit of HMC463LP5,If you need more circuits,please download HMC463LP5's pdf datasheet.